No satellite radio reception is available unless a SiriusXM Satellite Radio subscription is active. For all operation precautions, see “Audio operation precautions” . The satellite radio mode requires an active SiriusXM Satellite Radio subscription. The satellite radio is not available in Alaska, Hawaii and Guam. It may take some time to receive the activation signal after subscribing the SiriusXM Satellite Radio. After receiving the activation signal, an available channel list will be automatically updated in the radio. Place the ignition switch in LOCK to ACC to update the channel list. The auto loudness circuit enhances the low and high frequency ranges automatically in both radio reception and CD playback. Place the ignition switch in the ACC or ON position, and then push the ON·OFF button while the system is off to turn on the last audio source, which was playing immediately before the system was turned off. While the system is on, pushing the ON·OFF button turns the system off. Turn the VOL control knob to adjust the volume. To adjust Bass, Treble, Balance and Fade, push the Audio control knob. When the display shows the setting you want to change (Bass, Treble, Balance and Fade), rotate the Audio control knob to set the desired setting. For the other setting methods, see “How to use touch screen” . For more details, see “How to use the setup button” . The volume level of incoming sound can be selected from “Quiet”, “Medium” and “Loud” when an auxiliary device is connected to the system. For more details, see “How to use the setup button” . Pushing the AUX button will switch the displays between USB/iPod® and AUX. When the radio band select button is pushed while the ignition switch is in the ACC or ON position, the radio will come on at the channel last played. The last channel played will also come on when the ON·OFF button is pushed to ON. If another audio source is playing when the radio band select button is turned to ON, the audio source will automatically be turned off and the last radio channel played will come on. When the stereo broadcast signal is weak, the radio will automatically change from stereo to monaural reception. The satellite radio is not available in Alaska, Hawaii and Guam. • For AM and FM radio Turn the TUNE knob for manual tuning. • For SiriusXM Satellite Radio Turn the TUNE knob to seek channels from all of the categories when any category is not selected. low frequencies and to stop at the next broadcasting station. When in AM or FM mode, the radio can be tuned using the touch screen. To bring up the visual tuner, touch the “Tune” key on the lower right corner of the screen. A screen appears with a bar running from low frequencies on the left to high frequencies on the right. Touch the screen at the location of the frequency you wish to tune and the station will change to that frequency. To return to the regular radio display screen, touch the “OK” key. stations/channels can be set for the FM band (6 each for FM1 and FM2), 18 for SiriusXM Satellite Radio (6 each for XM1, XM2 and XM3) and 6 stations can be set for the AM band. 1. Choose the radio band using the radio band select button. 2. Tune to the desired station/channel using the SEEK/CATEGORY button or the TUNE knob. until the beep sound is heard. 4. The station indicator will then come on and the sound will resume. Memorizing is now complete. 5. Other buttons can be set in the same manner. If the battery cable is disconnected, or if the fuse opens, the radio memory will be erased. In that case, reset the desired stations/channels. When the SiriusXM Satellite Radio is being played, select “Channels” key to display a list of channels. Select a preferred channel from the list to change to that channel. When the SiriusXM Satellite Radio is being played, select “Categories” key to display a list of channels. Select a preferred channel from the list to display options within that category. Place the ignition switch in the ACC or ON position and insert the Compact Disc (CD) into the slot with the label side facing up. The CD will be guided automatically into the slot and start playing. If the system has been turned off while the CD was playing, pushing the ON·OFF button will start the CD. 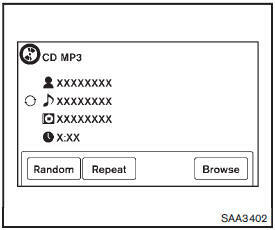 While listening to a CD or an MP3/WMA CD, certain text may be displayed (when a CD encoded with text is being used). Depending on how the CD or MP3/WMA CD is encoded, the text is displayed listing the artist, album and song title. seconds while the CD is being played, the CD will play while fast forwarding or rewinding. When the button is released, the CD will return to normal play speed. seconds while the CD is being played, the next track or the beginning of the current track on the CD will be played. When the rewind button is pushed for less than 1.5 seconds within 3 seconds after the current track starts playing, the previous track will be played. the left of the song title or folder name to denote which pattern is applied. To cancel Random mode, touch the “Random” key until no icon is displayed. Touch the “Browse” key to display the titles on the CD in list format. Touch the title of a song in the list to begin playing that song. If an MP3 CD is playing, touching the “Browse” key will also list the folders on the disc. Follow the procedure for selecting a song with the touch screen to choose a folder. When this button is pushed while the CD is being played, the CD will be ejected. The AUX IN jack is located on the lower center of the instrument panel. The AUX IN audio input jack accepts any standard analog audio input such as from a portable cassette tape/CD player, MP3 player or laptop computer. NISSAN strongly recommends using a stereo mini plug cable when connecting your music device to the audio system. Music may not play properly when a monaural cable is used. To switch to the AUX mode, push the AUX button when a compatible audio device is connected into the AUX IN jack. When the AUX button is pushed with no device plugged into the jack, the audio system does not change to the AUX mode. The USB outlet connector is on the lower center of the instrument panel. Connect a USB memory as illustrated, and then switch to the USB memory mode automatically. Do not connect, disconnect or operate the USB device while driving. Doing so can be a distraction. If distracted you could lose control of your vehicle and cause an accident or serious injury. • Do not force the USB device into the USB port. Inserting the USB device tilted or up-side-down into the port may damage the port. Make sure that the USB device is connected correctly into the USB port. • Do not grab the USB port cover (if so equipped) when pulling the USB device out of the port. This could damage the port and the cover. • Do not leave the USB cable in a place where it can be pulled unintentionally. several tracks. If the last track in a folder on the USB device is skipped, the first track of the next folder is played. on the USB device is playing to reverse or fast forward the track being played. The track plays at an increased speed while reversing or fast forwarding. When the button is released, the audio file returns to normal play speed. is displayed to the left of the song title or album name to denote which random pattern is applied. To cancel Random mode, touch the “Random” key until no icon is displayed. is displayed to the left of the song title or album name to denote which repeat pattern is applied. To cancel Repeat mode, touch the “Repeat” key until no icon is displayed. Connect the iPod® cable to the USB connector. If the iPod® supports charging via USB, the battery of the iPod® will be charged while connected to the vehicle. 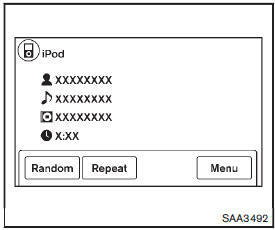 Depending on the version of the iPod®, the display on the iPod® shows a NISSAN or Accessory Attached screen when the connection is completed. When the iPod® is connected to the vehicle, the iPod® music library can only be operated by the vehicle audio controls. iPod® is a trademark of Apple Inc., registered in the U.S. and other countries. This unit may not control/operate correctly when connected to some iPod® versions/firmware and iPhone®. Make sure that the iPod® version is updated. Place the ignition switch in the ACC or ON position. Then, push the button repeatedly to switch to the iPod® mode. If the system has been turned off while the iPod® was playing, pushing the ON·OFF button will start the iPod®. 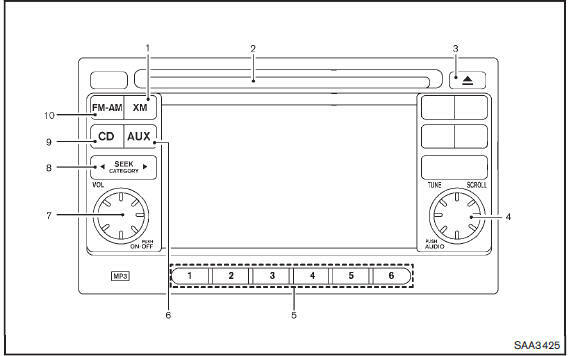 The interface for iPod® operation shown on the vehicle display is similar to the iPod® interface. Use the touch screen, BACK button or the TUNE/SCROLL knob to navigate the menus on the screen. The following items can be chosen from the menu list screen. For further information about each item, see the iPod® Owner’s Manual. — : returns to the previous screen. — : plays/pauses the music selected. seconds while the iPod® is playing, the iPod® will play while fast forwarding or rewinding. When the button is released, the iPod® will return to the normal play speed. : While files on a USB device are playing, the play pattern can be altered so that songs are repeated or played randomly. displayed to the left of the song title or album name to denote which repeat pattern is applied. To cancel Repeat mode, touch the “Repeat” key until no icon is displayed.